CSatCofC Students Win 2017 Wells Fargo Campus Analytics Challenge! This March, Xandre Clementsmith, a freshman double majoring in data science and math, and Jacob Mattox, a junior double majoring in computer and data sciences, will head to California to claim their cash prize for winning the 2017 Wells Fargo Campus Analytics Challenge! In today’s ever-changing technology environment, customers prefer quick and seamless interactions with their financial institute. Senior leaders at Wells Fargo are looking for a new product, service, or application that will improve the overall customer experience. Based on your analysis of the data, what recommendations do you have for senior leaders at Wells Fargo? Student teams could choose to create a simple blueprint analytics plan (Option A – prize: $1,000) or create fully developed solution (Option B – prize: $2,000 and trip to San Francisco). Xandre and Jacob chose to compete for the more ambitious, and more prestigious, Option B challenge, and were one of four teams chosen, along with teams from NYU, Texas Tech, and Illinois Institute of Technology, as winners. Teams from the University of Illinois at Urbana Champayne, Georgia State University, and Arizona State University, won the easier Option A challenge. Starting out with my first semester of college, I never expected that I’d be entering in a national data science competition. Yet within the first week, I was learning about my major in one of the best ways possible, by practicing it. For the next few months my partner and I worked on business ideas, statistical methods, data manipulation, and many other subjects to create a working data-based product for Wells Fargo. With a total of 81 submissions for the challenge, I never expected that we’d be selected as one of 7 winners, and I’m incredibly excited to travel to San Francisco in March for the Wells Fargo Analytics Summit. The trip will consist of connecting with both business and technology senior leaders at Wells Fargo, a presentation of the product and its use, as well as an awards ceremony. 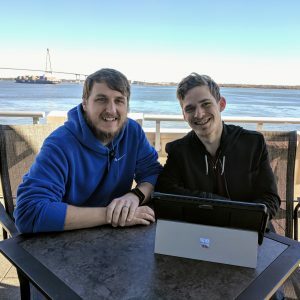 It’s fantastic to already have the opportunity to connect with businesses as an undergraduate, and I’m so thankful that I chose to attend the Computer Science Department here at the College of Charleston. Xandre and Jacob achieved this amazing accomplishment under the tutelage of Dr. Paul Anderson, director of the data science program at the College of Charleston.